Responding to a deepening economic crisis, serious structural problems with the tax system, a long and deep-seated opposition to even modest tax increases, and a weak tax administration, the Guatemalan government introduced a comprehensive tax reform program in 1992. 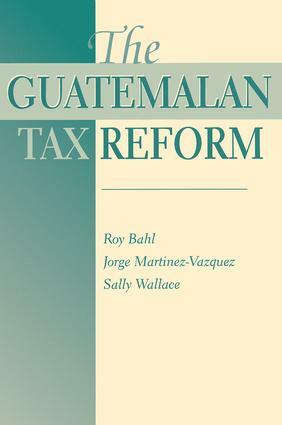 In this concise volume, Roy Bahl, Jorge Martinez-Vazquez, and Sally Wallace review the data that supported the creation of the reform program and evaluate the first round of revenues and tax-burden effects.Focusing their theoretical and empirical analysis on revenue yield impacts, on effects of relative prices and relative tax treatment of different types of companies, and on the distribution of tax burdens by income class, the authors factor in individual and company income taxes, value-added tax, taxes on international trade, and property tax. In each case, they describe the existing tax system and evaluate it against the traditional norms; in addition, they analyze alternative structural reforms within the Guatemalan context.Comprehensive tax reforms in less developed countries are infrequent, and the Guatemalan experience provides a fascinating case study of how modern analytic techniques can be used by policymakers to formulate tax structure changes. The authors also draw contrasts with experiences in other countries and revisit many of the principles that have been laid down for guiding tax reforms in developing nations.